to immediately come to mind is Margaret-Rose Arthur. This is not merely due to the fact that Ms. Arthur was among the first batch of females to enter the Army, but rather, because she became the first female soldier to hold several positions in the Guyana Defence Force that were traditional held by males. She was the first female soldier to be placed at Camp Ayanganna, the first to do a number of courses that were men-oriented, the first Staff Sergeant and even the first Woman Warrant Officer. “I think I was probably the first woman in the Army to hold that many positions,” Arthur reflected as she indulged an interview with this publication recently. Moreover, it was because she was the first female soldier appointed to several positions among other undertakings, including the first female boxing judge in the English-Speaking Caribbean, that she was aptly designated the nickname “First Lady”. 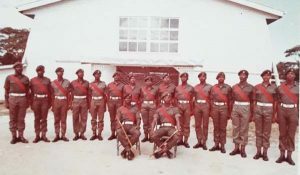 Arthur first enlisted in the Guyana Defence Force (GDF) on Monday, February 6, 1967. Although it was a novel endeavour, it wasn’t really much of a surprise that she opted to join the Army as soon as it became possible for a woman to do so. You see she was born on April 6, 1946 to Harold and Vivienne Arthur. While her mother was a very proficient homemaker, her father himself was a soldier who fought in World War II and was perhaps an inspiration to the young Margaret-Rose from an early age. Admiring some photographs taken while she was a soldier. intrigued by the activities occurring at Camp Ayanganna. At the time she hadn’t a clear idea as to what was occurring within the gated compound of the military base. As a student, cycling to and from school – St. Joseph’s High – her curiosity often got the better of her. The young Arthur, accompanied by some of her equally curious friends, would at times sneak through a usually unlocked gate to the army compound to have a closer look at the military operation within. It was then she was able to witness, though briefly, the operation of a refined group of men whose uniformed movements certainly helped to nurture her passion for things military. But the uninvited visits to the army base would be short-lived after Arthur and her friends were accosted by an Army rank who perhaps found them to be a nuisance. From that day onward, the gate to the army compound remained closed. But this did not dissuade Arthur from viewing the activities on Base Ayanganna from a safe distance. Indeed the passion she developed for the profession was undeniable but for obvious reasons, seemed unattainable for those of the female gender. The Army simply wasn’t accepting females. However, it wasn’t long after she completed high school that the Army started to advertise for women to apply to be enlisted too. Understandably Arthur was among the first set of women taking advantage of this opportunity. Standing at attention among the first batch of women soldiers. girls from Kitty too, but only two of us were accepted,” Arthur recalled. She spoke of having to undergo several physical, medical and academic assessments in order to determine her suitability for the Army. 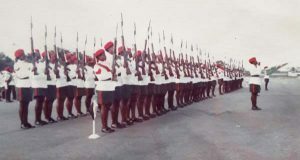 But after all this was done, the female military aspirants were vetted by ranks of the Police Force to ensure that they had no criminal record or any such inclination. “It was strange how they did it back then,” said Arthur of the Army recruitment process. Once cleared by the Police Force, Arthur recalled that she was ready to be officially recruited as a soldier. “It was a set of young women, all clueless, but we were willing and happy to know that we were found suitable for the Army,” recalled Arthur who was about 20 years old at the time. A collage of the young Margaret-Rose Arthur. Army’s hierarchy decided to enlist women. “They were taking in women so that they could free up the men to go out in the field. Back in the day the men had to do everything…they were cooks, they were in the office, they did everything and still had to go out in the field…so with the women on board the men were free to focus more on going out in the field,” Arthur explained. The women who were among the first batch to join the Army were divided into four groups for which they had to develop skills. The groups, according to Arthur, were: drivers, mechanics, signallers and typists. The typist group was the smallest of them all, amounting to about six individuals. Arthur was selected to be a part of this very group. However, she wasn’t the average typists, since being a part of the GDF meant being fully exposed to military training. In fact, Arthur pointed out that being a military typist saw her learning to do the work of a typist the military way. simple typist. We had to learn service typing…the military layout of correspondence I learnt was different from civilian style, and we had to be taught that,” Arthur disclosed. Although the military training that was simultaneously received was on par with that offered to male recruits, Arthur, as well as the other women with whom she trained, were merely enlisted as Army reserves. Moreover, after completing her training, she and the other recruits were allowed to return home rather than remain at an Army base as a full-time soldier. But shortly after returning home, Arthur recalled that yet another groundbreaking decision was made. This time the Army was willing to accept women soldiers on regular strength. This, according to Arthur, translated to women being on staff, just as their male counterparts, rather than merely remaining reserves. 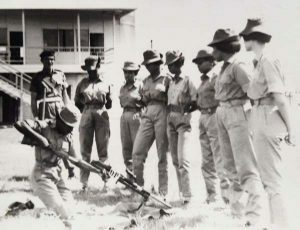 During a weapons training session. group of women to be accepted on regular strength. Arthur, however, was the very first individual woman soldier to be brought to work at Camp Ayanganna, where she assumed duty at the Registry, proudly holding the rank of Sergeant. This development, of course, allowed her to achieve two firsts for women soldiers. “I don’t know that there is any claim to fame because of that, but I do know that I was the first and only woman at Ayanganna working at that time in the Registry, and then it was called the ‘White House’ and I became the first female staff Sergeant for that,” related Arthur amid a hearty chuckle. The petite, five foot three Arthur was expected to spend her every day among some burly men and somehow try to fit in professionally, and she did. “There was always mutual respect,” she recalled. After working for two weeks as the lone female soldier, she was eventually asked to help locate the other female soldiers with whom she trained in the typist group, so that they too could join the Force on a full-time basis. But not all of the women did, Arthur said, as she easily remembered the names of the four other women who eventually came on board. They were followed by those trained as signallers and then the other groups. Flanked by her male colleagues following a drill course. for training at Base Command Timehri. Of course in those days it was different…the whole layout of Timehri was different, there weren’t all of those buildings; there was a massive training ground and you could have done a whole lot of training,” Arthur recounted. She recalled one of her firsts as a female soldier was being allowed to undertake a number of courses that were traditionally offered to male soldiers only. “I don’t think it was because of anything I did, other than the fact that I was a woman,” a modest Arthur emphasised. But among her most memorable unisex training programmes was one conducted with two other female soldiers, Brenda Aaron and Gwen Fredericks. Training on this occasion was at Tacama, and required that each individual soldier dig trenches for battle that were deep enough to cover their respective length. The task wasn’t simple at all, Arthur stated, since according to her, “we were using pick axes and when it touched the ground there was not a mark on that ground. But we had to dig in into that hard ground. We arrived in Tacama under the cover of night and we had to be covered by morning, because this was supposed to be a mock war and the enemy was coming”. She remembered being partnered with a seven-foot male soldier and recalled that there was a great deal of digging to be done. But after the digging had ended and the dust had settled, Arthur found that ascending to the top of her trench was an equally challenging task since her diminutive frame was much more covered than her very height-endowed partner. Although some may be of the belief that the training for female soldiers was not at all tedious, Arthur assured that not only was training tedious, but even life-threatening at times. She recalled being engaged in a training dubbed ‘The Pepperpot’ which required that a soldier run towards a target in a straight line or risk being hit by live bullets (being fired by a rank offering cover from behind) if she veered off course. Arthur recalled it was while in training in Tacama too that she narrowly escaped being attacked by a tiger cat while attempting to take a bath at a nearby waterway, and it was there too that she barely dodged a tracer bullet during a routine exercise. But what was perhaps the most heartening segment of her military career was helping other women to become respectable soldiers too. “I remember very well conducting training on the West Coast of Demerara. It was such a sight for the residents over there, because at that time seeing a female soldier was such a new thing. There was always chaos and confusion in any village we went to, and this usually attracted remarks like ‘oh, look we girls’,” recounted a beaming Arthur. Arthur duly moved through the ranks during her 25 years military career and retired as a Warrant Officer Class Two. She was perhaps among the few Non-Commissioned ranks who also held positions in the administrative fields reserved for Commissioned officers. While her contributions to the Army are many, what could easily be considered her most important ‘first female’ role was that of Recruitment Officer, a position she held for several years. “Sometimes I would run into people who would ask ‘you can’t remember recruiting me?’ I do remember a number of people, many of whom have become very outstanding,” said Arthur who also remembered being hand-picked to work in a few other positions including Personal Assistant to the then Force Commander and later for then Chief of Staff, Norman McLean. Although she holds the honour of being the first female officer to hold many positions in the Army, she will forever be remembered for her many years of unmarred contribution and dedicated service to the military organisation. 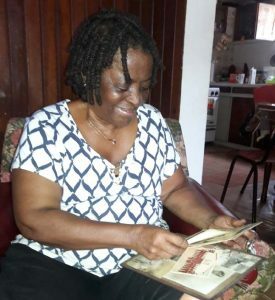 ”You had to be tough to be a soldier,” said Arthur, who not only matched her male counterparts in whatever she did, but also took time out to nurture her greatest achievement, her son – Keverne Anson Arthur. Continuing her service to the Army meant finding good home care for her son, which Arthur said she was lucky to find. 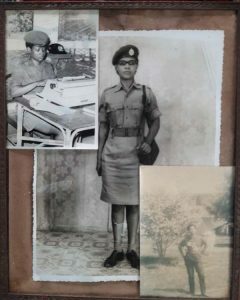 “It wasn’t easy balancing my personal and professional life,” she recounted, as she frankly asserted that “although the Army took a great deal of my time, it also offered me the opportunity and I had encouragement to develop myself academically, and even in terms of skills”. She was not only exposed to the junior police officer training programme but was able to undergo teacher training at the Cyril Potter College of Education, thus allowing her to become a teacher after retirement. 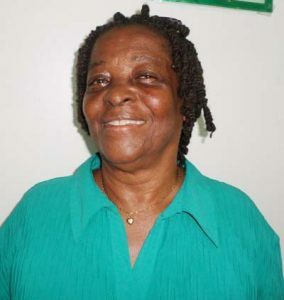 Today Kaieteur News recognizes the many contributions of Ms Margaret-Rose Arthur and bestows upon her the coveted but very deserving title of our ‘Special Person’.